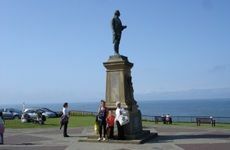 Whitby in England Attractions, Photos and Accommodation. Whitby is situated in North Yorkshire at the mouth of the River Esk in England. 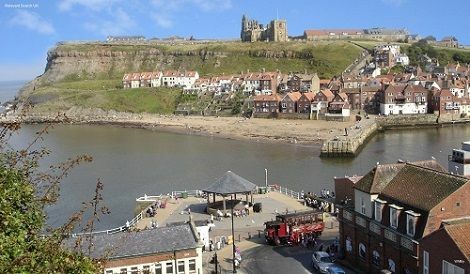 Today, the town is a major tourist attraction with the Captain Cook Memorial Museum, many boat trips including a scaled down version of the Endeavour, Whitby Jet jewelry, sea fishing, amusements, many kids play areas, restaurants, bar/diners and a good selection of fish and chip shops. The first recorded settlement here was named Streonshal in 656. The Christian king of Northumbria ( Oswy) founded Whitby Abbey at that time. That monastery was destroyed by Viking raiders in 867, with rebuilding begining in 1078. The town was named Whitby around that time, meaning white settlement in Old Norse. 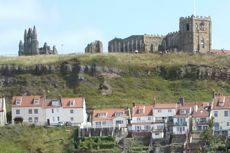 Whitby had between 20 and 30 houses in 1540. By the early 1600s, the town had grown substantialy with the trade in alum, a chemical compound used in industry, medicine and cosmetics. The town expanded more in the 1700s with shipbuilding and whaling, as well as mining jet, a black rock found in the areas cliffs that is made into jewelry. 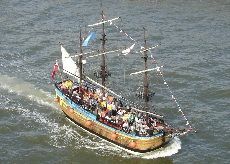 Tomas Fishburn built in a coal carrying ship at Whitby in 1764, named Earl of Pembroke. The Royal Navy bought that ship in 1768 to be converted to serve as their exploration ship named HMS Endeavour. Captain James Cook comanded the ship on voyages to Australia and New Zealand. Cook had moved to Whitby in 1747 to work on ships transporting coal along the English coast. He joined the Royal Navy in 1755, and made three round the world voyages, the first in 1766. Cook was killed on his third voyage on the Island of Hawaii, after a skirmish with the islanders.